This week's document is one small piece of lined paper, 4 15/16" x 7 15/16". It's yellowish-green with no watermark. It reminds me of the pages you see in a stenographer's notebook, but there are no perforations indicating it was torn from a book. The writing is in pencil in a strong hand. I'm pretty sure it's Jean La Forêt's handwriting. 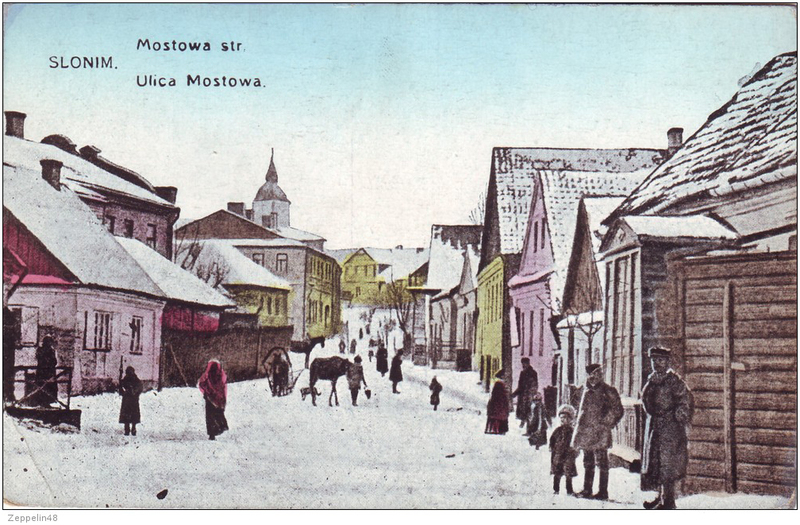 It is undated. Maybe Jean made this list to keep it handy while he and Emma were living in Missouri. I wonder why it's on this paper and not one of the pages in his journal. It's nice to have the siblings' names with those of their spouses. Emma didn't include the spouses' names in her writings. Louisa and Alvina appear to have lived down the street from each other, although Louisa's box number was left out. 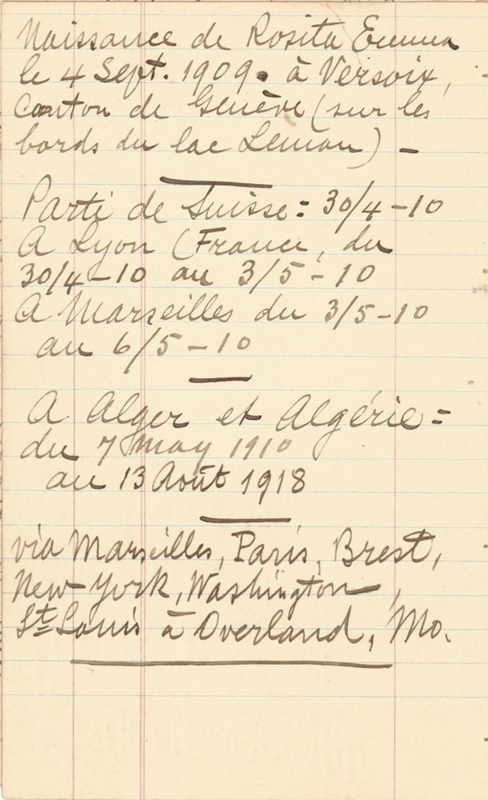 We learned from Jean's list of dates that he went to Overland in 1918 (although Emma said in her handwritten narrative that he came in 1919), so he and Emma were apparently living close by. In my comments on the second part of Emma's narrative, I mentioned that some surnames kept popping up. 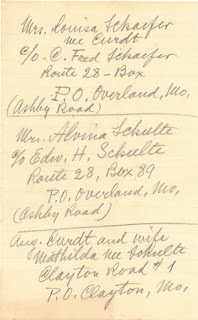 From this list of addresses, we can add another Schulte to the family. 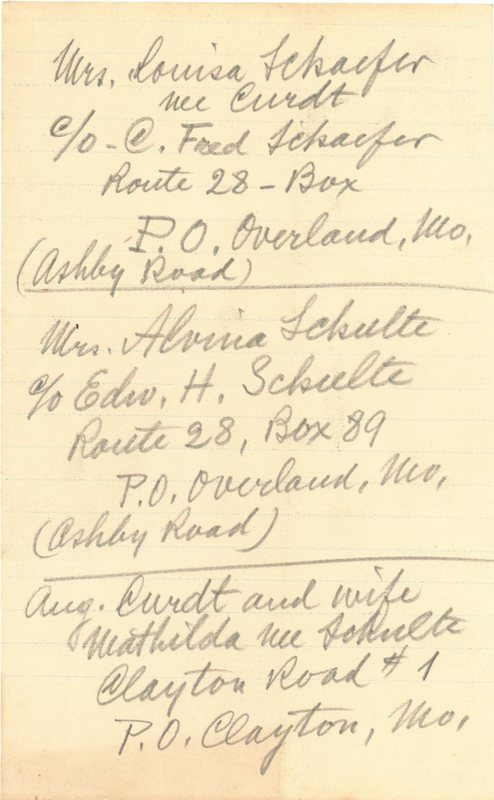 So Emma's oldest daughter, one of her sisters, and her brother married Schultes. This is sounding even more like an insular community. Or maybe they were all part of the conspiracy? Could "Bertram" and "Bertolet" Be Named for the Same "Bert"? 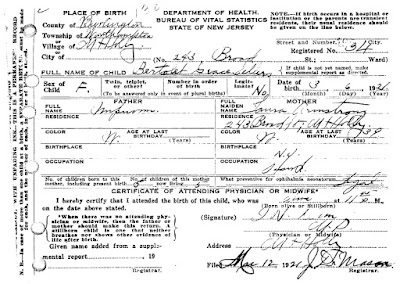 Bertolet Grace Sellers birth certificate, March 6, 1921, father "unknown"
I've written previously about how I proved that the man my great-grandmother married was my grandfather's adoptive father. 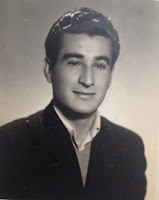 Of course, once I did that, my new task became the search for my grandfather's biological father. The last two in particular have really had my mind whirling. Not only do Bertram and Bertolet have "Bert" in common, let's face it, "Bertolet" isn't exactly your garden-variety, everyday name. I started thinking, Hey, maybe this guy's name really was Bert-something (maybe Bertram? ), and Laura and he got together again after Elmer died. That's why she named her daughter Bertolet, after him. 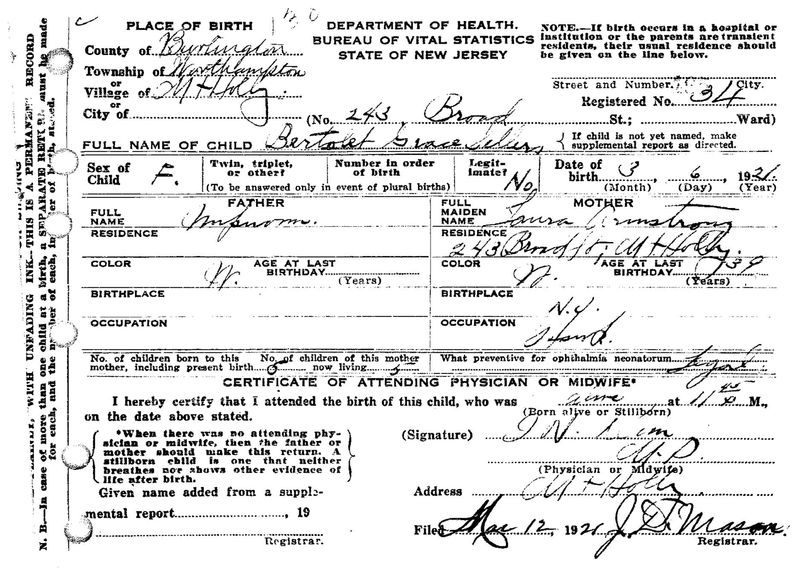 I figured the most direct way to try to find the answer was obtaining Bertolet's birth and death certificates. Makes sense, right? 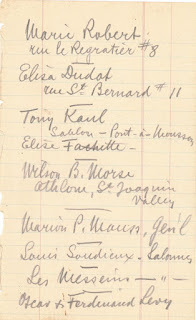 So when my sister told me she was going to Trenton again to visit the state archives, I asked her to look for Bertolet. She found both of the certificates. But . . . Laura foiled us again. Neither certificate lists the father! So much for the easy route. That woman sure liked to keep her secrets. 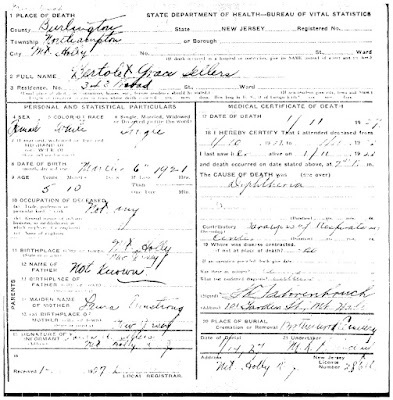 Bertolet Grace Sellers death certificate, January 11, 1927, father "not known"
What if our great-grandfather was a married man (most likely) and wanted to name his child Bertram. Laura gets pregnant and "Papa Lynn" insists he'll take the child away from her . . . IF it's a boy. Laura doesn't want the child taken away from her, so declares the child a female and names "her" Gertrude on the birth certificate. Actually calling/naming Grandpa Bertram Lynn was thumbing her nose at Papa Lynn, even though she corrected the BC years later. In the meantime, Papa Lynn goes on with his life and Laura marries Elmer. Papa Lynn HAS his baby boy and names him Bertram. But wait . . . Papa Lynn was NOT a married man, but Laura's childhood sweetheart from an affluent family! She was their domestic! He was a few years younger and his family frowned upon the older Laura. The family threatens to take her male offspring, so she names him Gertrude and then marries Elmer. Elmer dies and Laura reaches out to Papa Lynn to confess her secret. They rekindle the flame and create Bertolet. Whatever the reason was, we didn't get the answer we were hoping for. Now I'm working on the Y-DNA angle. My father has a match at 107 markers, which means something like 6th cousins. Luckily, the guy has a bare-bones family tree on FTDNA. I'm working it backward and bringing every male line forward in time, hoping to find someone who plausibly could have been in Burlington County, New Jersey (or Philadelphia as a reasonable second possibility) in 1902. In a funny coincidence, the man who matches my father has an Irish name. Maybe that Ancestry DNA test will prove to be right about my Irish ancestry after all? 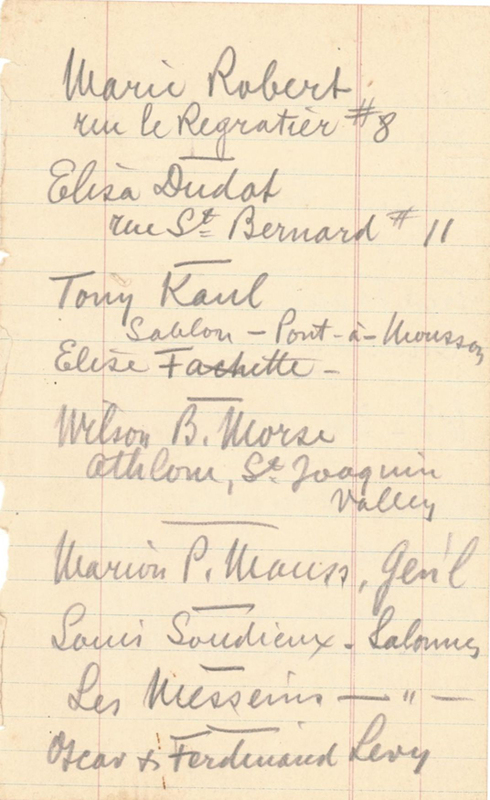 Now that I've finished up with Jean La Forêt's journal, I'm back to regular documents, and the first one is Jean and Emma's actual marriage certificate from 1908! And I thought I was going to need to order it from Duval County. (I may still try to get a copy of the marriage license application, if it still exists.) Please forgive the imperfect image; I had to scan it in two parts, and my tiling was inexact. But you can pretty much see everything. This piece of paper is 12" x 9 3/8" and yellowish; it might have originally been white. It's about a 20# bond weight. There is a watermark, though I can't tell exactly what it is; it seems to be an image of a person, apparently a man, because he's wearing pants. The head is cut off. 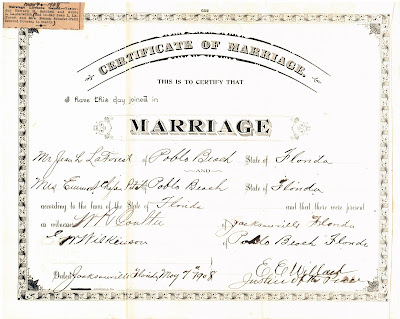 This was a blank form that was filled in after the marriage was performed. The Justice of the Peace's seal is impressed in the lower left corner. 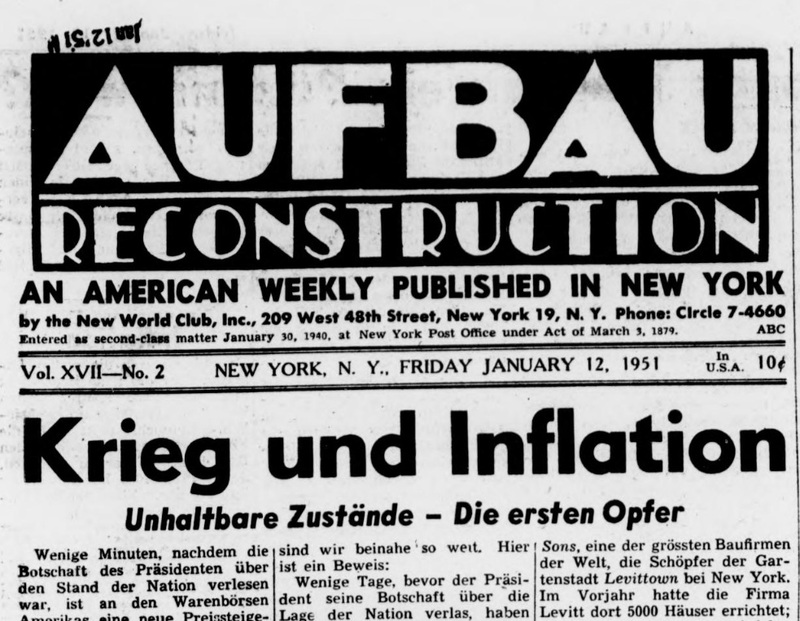 In the upper left corner, a newspaper clipping was pasted onto the certificate. The paper was folded twice as though to fit in an envelope. In addition, the far right side was folded over about a quarter of an inch, which I did not notice until now, so it was scanned with that fold. 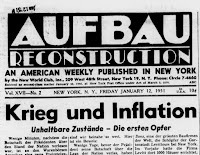 Following the transcription of the certificate is a transcription of the newspaper clipping. What struck me immediately as I began to transcribe this was the spelling of Jean's last name. 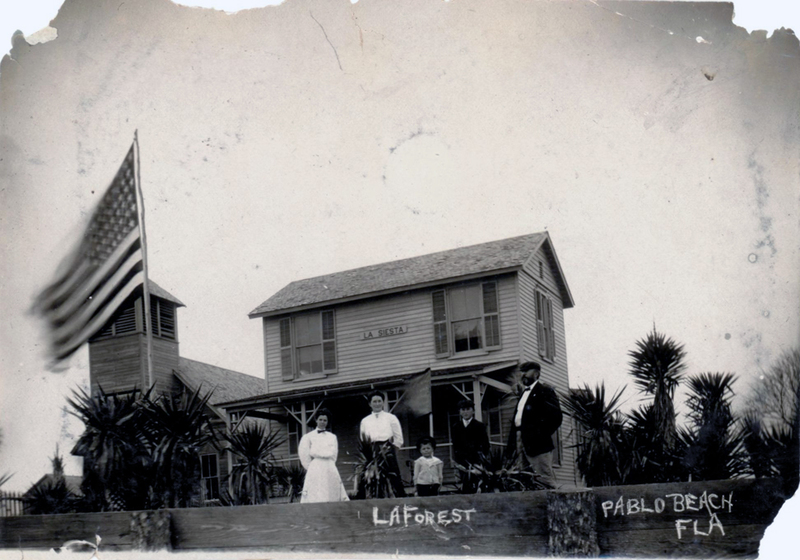 Both on the certificate and in the newspaper announcement of the marriage license it is spelled LaForest. Now the name as it appears on the photograph from Pablo Beach makes more sense. But I wonder why Jean's name was spelled this way in Florida. The next thing that jumped out at me was "Poblo" Beach. Judging by the same photograph, that wasn't the way everyone spelled it. Maybe it was an idiosyncracy of Justice Willard. I wonder what was blacked out in the lower left, before the words "Jacksonville, Fla." When I look at it under a bright light, it seems to be three words covered by felt marker (or whatever the equivalent writing implement was in 1908). I think I can make out "Co." at the end, so maybe it was simply the company that printed the forms. But why black it out? 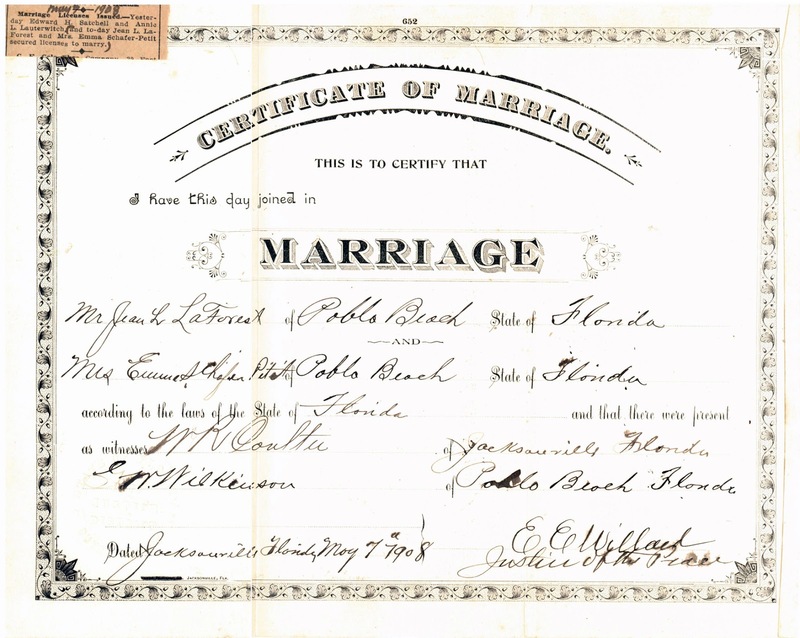 Jean and Emma got their marriage license and married the same day. I thought it was a sweet touch that someone marked Jean and Emma's listing with parentheses on the newspaper clipping. I've never seen a license announcement glued to a marriage certificate before. 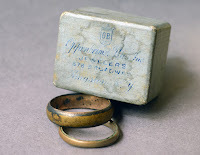 It was entertaining to compare the actual marriage certificate with the transcription that Emma submitted with her application for a pension based on Jean's military service. Not counting discrepancies with punctuation (of which there were several), I found six differences between the original and the transcription: LaForet instead of LaForest; Pablo instead of Poblo (three times); the second witness was listed as Wilkerson, but it's actually Wilkinson; and 7 instead of 7th in the date. That's significantly worse than the differences in transcription of Emma's divorce decree. So much for the "true and correct copy" certified by notary W. T. Kelley! The marriage certificate was in this envelope when I received it. I'm not sure whose writing this is, but it's likely either Jean's or Emma's. I like the little doodle at the bottom of the back side of the envelope. I've just returned from a great educational opportunity. The annual Civil War Teacher Institute is an event run by the Civil War Trust, and they really respect and appreciate educators. 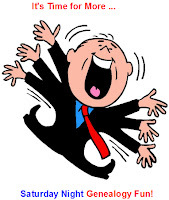 Attendance is actually free — when you register you pay a deposit of $100, but it's refunded after you attend. They just want to make sure you're serious. The institute is targeted primarily at K–12 teachers and museum professionals, but educators and historians of all types are welcome. When I told people that I taught family hyistory, that seemed to fit right in. 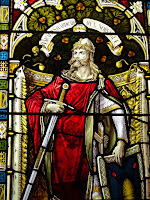 And even though the approach for the workshops and tours was from big-H history, it was not difficult to see family history aspects of almost everything I learned. The 2016 institute was held in Richmond, Virginia. Things started Thursday night with a reception and buffet dinner. One of the speakers was Reggie Harris, a performer who has created dialogs and songs to educate people about the Underground Railroad and other aspects of the historical conditions of black people in this country, particularly around the time of the Civil War. We had Friday morning to ourselves (breakfast that day being the only meal not provided). Instead of sightseeing, I headed over to the Library of Virginia for some on-site research (and I am now the proud owner of a Library of Virginia library card!). Then everyone met at the host hotel for a buffet lunch, where the speaker was author and former teacher Kevin Levin. He subject was that, no matter what people say, the Confederate flag is and always has been a symbol of racism and white supremacy. By extension, notwithstanding high-minded speeches about states' rights and sovereignty, from the Southern perspective the Civil War was about maintaining the institution of slavery, pure and simple. He made his points passionately, giving several excellent examples to illustrate them. (It was a shame that the keynote speaker for the Saturday night banquet resorted to the jaded claim of "Federalism versus states' rights" as the cause of the war, but some people will always cling to their rationalizations.) Levin is currently working on a book about the black "body servants" (i.e., slaves) that many Confederate officers brought with them to battles and the persistent myth (many, many times disproved) that these men "fought" as armed soldiers. In the afternoon six different workshops were offered in three tracks. I passed on "Richmond in the Civil War" and "Using Art to Teach the American Revolution." I first chose "Teaching Civil War Military History by Accident", which ended up being about using simplified miniatures rules to get students interested in studying military history. The instructor, John Michael "Mike" Priest, uses 54 mm figures becaue they're easier for small hands to maneuver, and cards because they're a little easier than dice and less of a swallowing hazard. 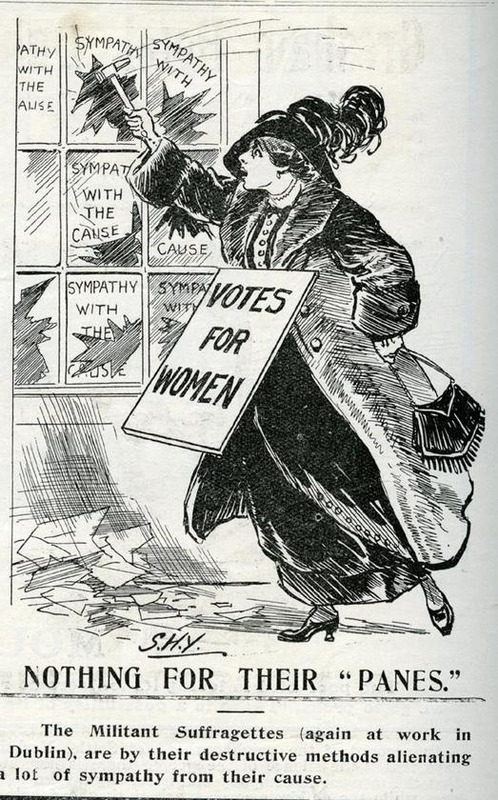 (I participated in the demo later in the day and led the winning side.) The same person taught the second session I went to, "Locating and Evaluating Civil War Primary Sources for the Classroom", on online sites for historical primary sources. 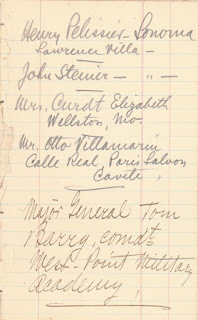 He listed several sites I am familiar with, such as Fold3.com and Chronicling America, but some on the list were new to me, such as War Papers of the Military Order of the Loyal Legion of the United States (MOLLUS) and Pennsylvania Volunteers of the Civil War. For the third session I seriously considered going to the talk about "Civil War Navies: Brown and Blue Water Warfare" (I'm a sucker for a Navy man), but fortuitously I chose instead to go to Jesse Aucoin's presentation on "Journey through Hallowed Ground." This is a project to plant a tree within a designated National Heritage Area for each of the more than 620,000 soldiers, Union and Confederate, whose deaths were caused by the Civil War. 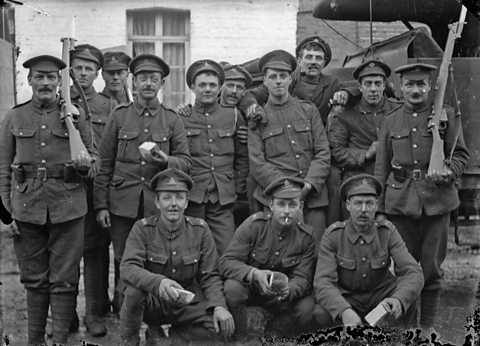 (Men who died after the war due to injuries or illness from the war are eligible.) As part of the project, research done on each man is added to his public page on the Fold3 "Honor Wall." Currently the organization has been reaching out to schools and having students research soldiers as class projects, but I thought this looked like something a lot of genealogists would be interested in. I'm going to be talking with Jesse about modifying her presentation to target genealogists, and I hope to start speaking about the project in the Bay Area next year. On Saturday, after a lovely breakfast buffet, we had our first day of field trips. The choices were "The Bloody Battles for Richmond", "400 Years of History on the Peninsula", and "In the Trenches at Petersburg", which is what I opted for. The first half of the day was spent at Petersburg National Battlefield, where at our first stop National Park Service Ranger Grant Gates demonstrated how General Ulysses S. Grant cut off General Robert E. Lee's supply lines to Petersburg by creating a human map on the grounds. He asked for volunteers and designated them as Grant, Lee, the cities of Richmond and Petersburg, and the five railroad lines coming out of Petersburg. The rail lines were represented by strings held on one end by each of the rail heads and on the other by Petersburg. Gates had Grant and Lee bounce off each other in a circle around Richmond, with Lee between Grant and Richmond, to show how Lee was able to block Grant from his original goal of taking that city. 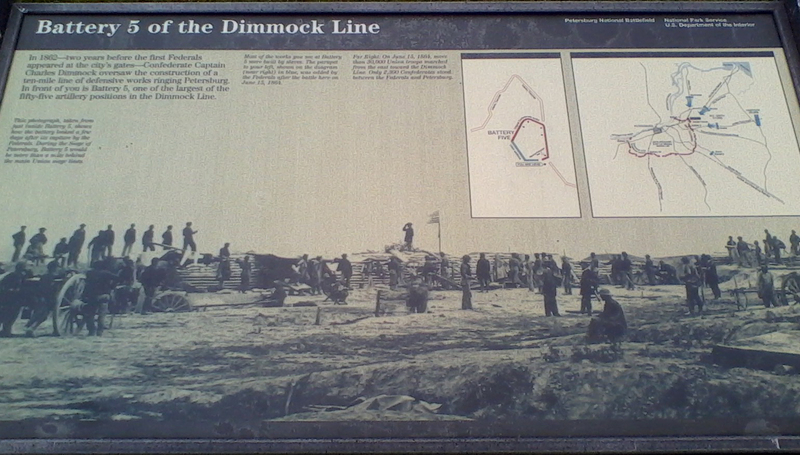 Then Grant walked about the perimeter of Petersburg, stopping at each rail line and cutting the string. (I was Boydton Plank Road and South Side Railroad.) It was a clear illustration of how Grant stretched out Lee's men and slowly cut off his supply lines. 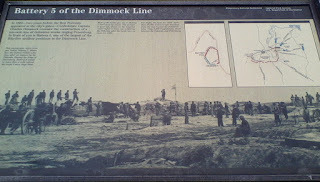 This location has some surviving earthworks and interpretive displays, including one board explaining that earthworks were created with slave labor. 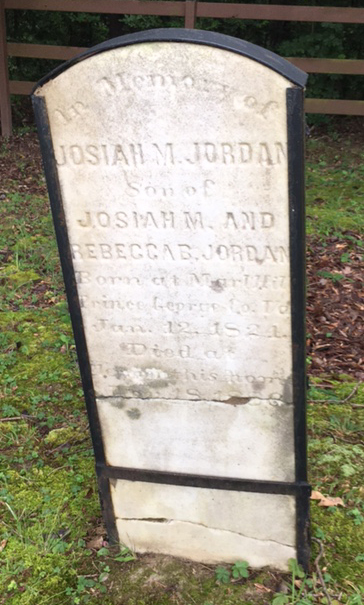 This area was owned by the Josiah Jordan family. Their house was destroyed, and a small depression in the earth is what remains to mark the spot. A small family cemetery is fenced off from the main grounds; the rangers don't include it in their talks. The next stop was "The Crater." I had never heard of the Battle of the Crater, but now I know it was where, in July 1864, Union forces dug a tunnel underneath and blew up a Confederate battery, Elliott's Salient, leaving a sizable hole in the ground. It was where USCT soldier Decatur Dorsey earned a Medal of Honor through his actions as the color bearer of the 39th Regiment. 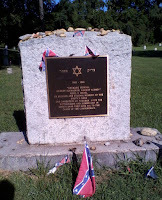 Unfortunately, it was also where about 200 USCT soldiers were massacred, most by Confederates but some by their own Union comrades. The Union lost this engagement, and Lieutenant General A. P. Hill paraded the intermixed black and white prisoners of war through the streets of Petersburg to horrify the populace. We were told this was the first time Southern troops had actually faced black soldiers in combat. William Mahone, the Confederate general in command at the Crater, surprised everyone during Reconstruction by creating a mixed black and white political party, the Readjusters. While it appears he did so for purely pragmatic reasons, not because his opinion of black people had actually changed, it forever tainted Virginians' views of him. The latter part of the day was spent at Pamplin Historical Park/Museum of the Civil War Soldier. This is an educational complex with two museums; reconstructed models of a plantation big house and slave quarters; reconstructions of Civil War era earthworks, so visitors can get an idea of what it was like to behind a bunker; antebellum homes; even a soldiers' camp. The large plot of land was donated by Robert B. Pamplin, Sr. and Dr. Robert B. Pamplin, Jr., descendants of the slave-owning family that owned the original plantation on whose grounds the complex now stands. It looks like the family came out pretty well after the war. After a buffet lunch in the museum dining room, we had an hour in the main building, the Museum of the Civil War Soldier. This has a unique audio set-up. You choose one of thirteen historical soldiers, and a docent programs your choice into your audio player. On entering each room in the museum, the audio kicks in automatically and gives you a two- to three-minute overview of the subject, e.g., camp life, hospitals, etc. In each room are several numbered cards for different subjects. 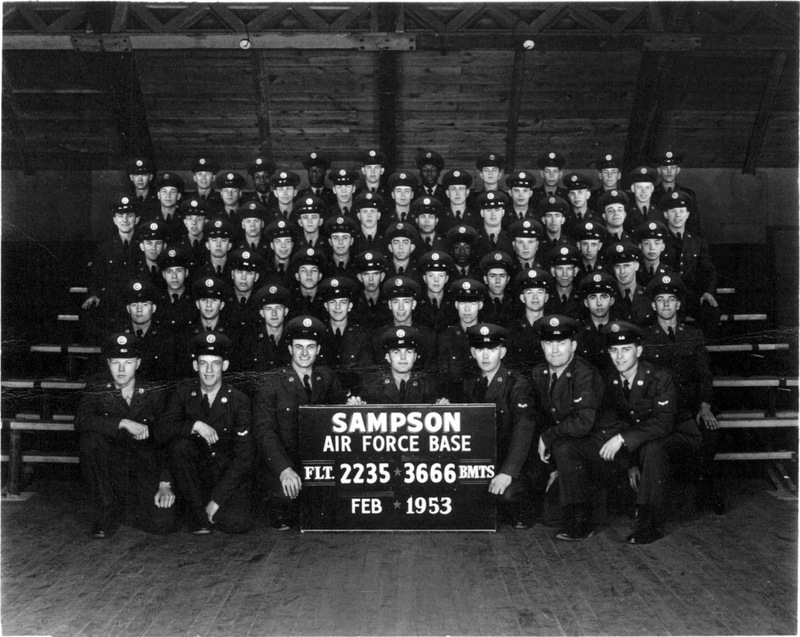 You punch in a number, and you hear a short piece about your soldier, in his own words. At the end you find out if your soldier lived through the war. 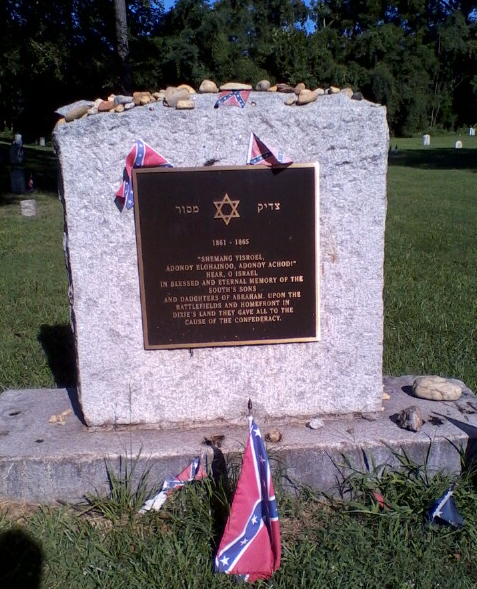 I chose Alexander Heritage Newton, the only USCT soldier on the list (there were no Jewish soldiers available). He survived the war, became a minister, and wrote an autobiography which included information about his USCT unit. One of the choices is a young drummer boy, intended for use by school children (he also survived the war). After this museum, we went outside to the big house and slave quarters area, where the foundation is now growing a garden similar to what the slaves would have had. Then we headed to the soldiers' camp, where a reenactor described some of the daily life of a Confederate or Union soldier. After a short rifle demonstration, he rounded up some volunteers and marched them around in the sunny 95/95 weather (95 degrees and 95 percent humidity) while the rest of us watched from the shade. At the Saturday evening banquet, former University of Georgia football coach Vince Dooley was one of the speakers. Dooley earned a Master's degree in history and apparently has maintained an interest in the subject. The description of Pickett reminded me a lot of George Armstrong Custer. Pickett was the last in his class at West Point, had a huge ego, was very proud of his shoulder-length hair, and was extraordinarily devoted to his wife. 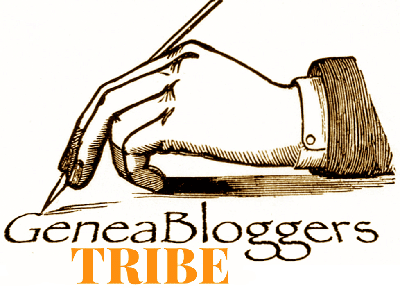 In addition, after he died, his wife wrote glowing, heavily exaggerated stories about him. He was the Confederacy's version of Custer! This was a wonderful program, and I am very happy I was able to attend. If you teach history, if you are fascinated by the Civil War, I encourage you to consider going next year. At the Saturday night banquet, it was confirmed that the 2017 institute will be in Memphis, Tennessee, though the dates are not yet posted. 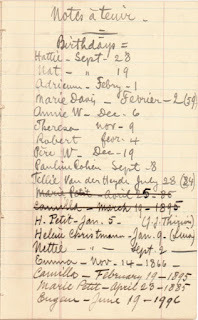 Saturday Night Genealogy Fun: How Many Ancestors Did You "Meet"? 2) Tell us their names, where they lived, and their relationship to you in a blog post, in comments to this post, or in comments on Facebook. • Bertram Lynn Sellers, Jr. (1935– ), my father, has lived in multiple locations in New Jersey; multiple locations in New York; Sanford, Florida; Miami, Florida; Los Angeles County, California; Sydney, New South Wales, Ausralia; Okaloosa County, Florida (two separate stints); Villa Tasso, Florida; Mossy Head, Florida; Cleveland, Ohio; and San Antonio, Texas. 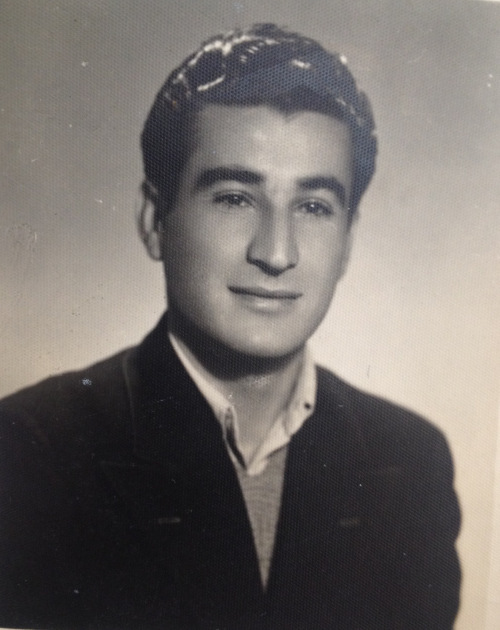 • Abraham Meckler (1912–1989), my maternal grandfather, lived in Brooklyn, New York; Miami, Florida; Las Vegas, Nevada; Margate, Florida; and I think Sunrise, Florida (until his death in one of the two latter locations). 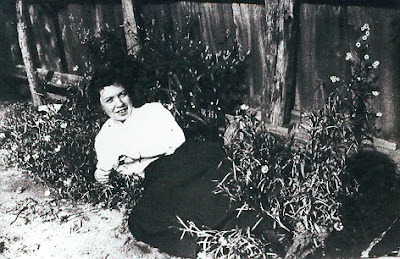 • Lillyan E. (Gordon) Meckler (1919–2006), my maternal grandmother, lived in Manhattan; Brooklyn, New York; Miami, Florida; Las Vegas, Nevada; Margate, Florida; Sunrise, Florida; and then in Carson City, Nevada until her death. 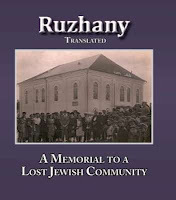 • Sarah Libby (Brainin) Gordon (about 1890–1963), my great-grandmother (mother of Lillyan), lived in Kreuzburg, Russian Empire (now Krustpils, Latvia) and Manhattan, where she died. I have no documentation that I met her, but my mother told me that she took me to Florida to meet her grandmother while I was still a babe in arms, and my father remembers the event also. 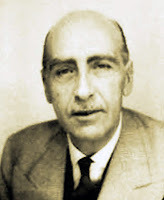 • Bertram Lynn Sellers, Sr. (1903–1995), my paternal grandfather, lived in multiple locations in New Jersey; multiple locations in New York; and Okaloosa County, Florida (that I know of). He died in Niceville, Okaloosa County. 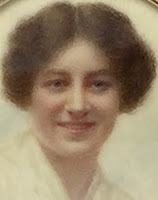 Laura May (Armstrong) Sellers Ireland (1882–1970), my great-grandmother (mother of Bertram Sr.), died eight years after I was born, but I never met her. The rest of my ancestors died well before I was born. So I have met only seven of my ancestors, one fewer than Randy, and one of those I have no recollection or proof of. And Randy thought eight was a low number! 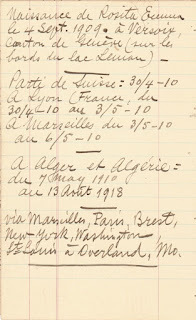 We've reached the end of the pages in Jean La Forêt's journal that have entries on them. These pages seem to be notes rather than something organized. Maybe these were just pieces of information Jean wanted to remember and keep track of. None of this writing requires translation. As with the list of birthdays last week, some of these are names we've seen before, but most are totally new. Adrienne's full name is very pretty. 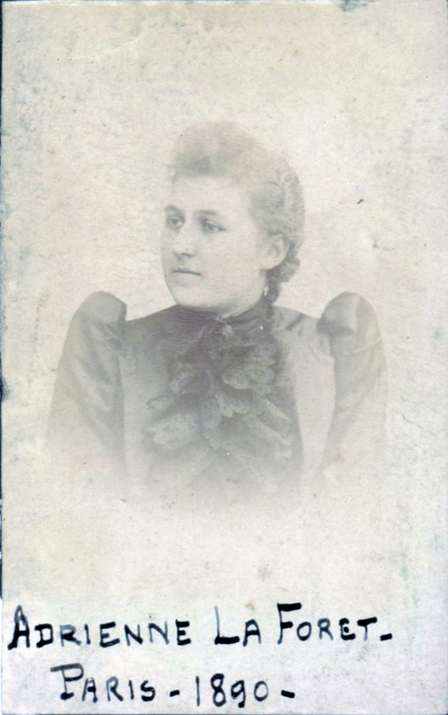 About halfway down the list is Emma's mother, Elizabeth Curdt, in Wellston, Missouri. And near the end of the list is Wilson B. Morse. He's the man Jean visited May 14 to June 14, 1890. 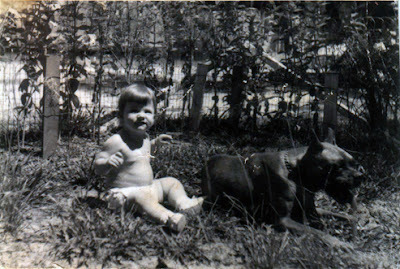 Jean had a Pauline in his birthday list, but her last name was Cohen. Maybe Pauline Cohen married Eugen Stein? 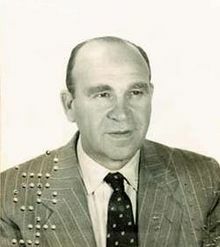 But is Eugen Stein the same man as Eugen Messein? 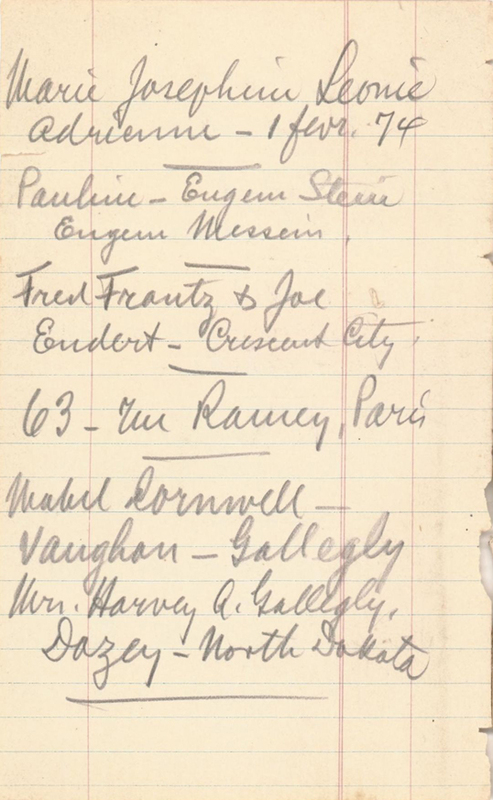 Some names appear to be people Jean met on his travels bu didn't mention previously. We know he was in Crescent City and Cavite. Considering the problems he had in Crescent City, I'm surprised he cared to remember anyone there. 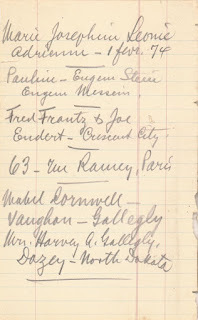 The Paris address might have been Adrienne's, since the photograph of her has Paris written on it. With no context for the other names, I have no idea who they were. I'm sure many cities have a rue St Bernard, but maybe not as many have a rue le Regratier. Jean has left me another mystery to work on. 1870: Thomas was born May 23, 1870 in Fairview, Medford Township, Burlington County, New Jersey and was enumerated in the U.S. population census on June 28 in Medford Township with his parents, James and Amelia (Gibson) Gauntt, and older siblings Charles, John, James, Sarah, and William. Although Thomas was not enumerated twice, his brother Charles was; on July 14 Charles was in Evesham Township in Burlington County. 1880: In the 1880 U.S. population census, Thomas was enumerated with his parents, James and Amelia, older brother William, and baby brother Samuel. 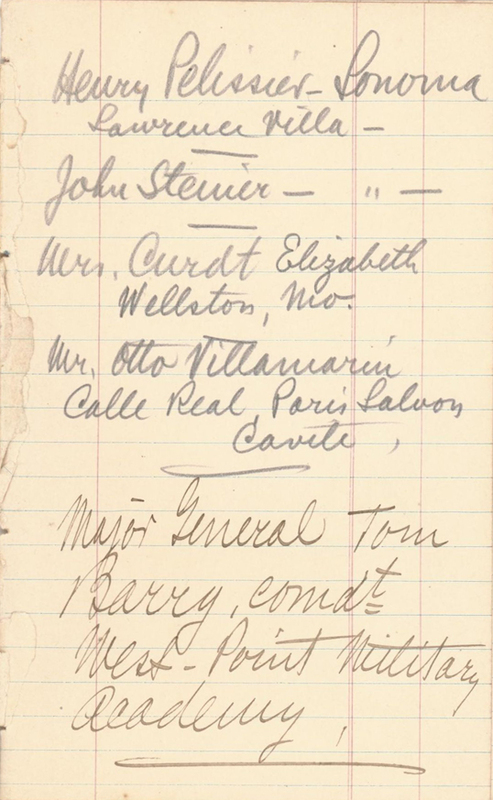 The census taker came by on June 15, and the family was living in Mt. Laurel, Burlington County, New Jersey. 1885: In the 1885 New Jersey state census, Thomas is not living with his family but is working as a farm laborer in Centre, Camden County. 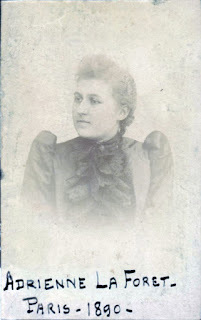 1895: The 1895 New Jersey state census is the first in which Thomas is enumerated with my great-grandmother Jane Dunstan; they married on September 2, 1891. What's interesting is that they were living in Centre, Camden County, but without their two children, born in 1892 and 1893. I'm still looking for the children, especially since one is my grandmother. 1900: In the 1900 U.S. population census, Thomas Gauntt, a farm laborer, was enumerated on June 27 in Mt. Laurel, Burlington County, New Jersey. Also in the household were his wife, Jane Gauntt, and children Frederick, Anna (my grandmother! ), Carrie, and Mary. 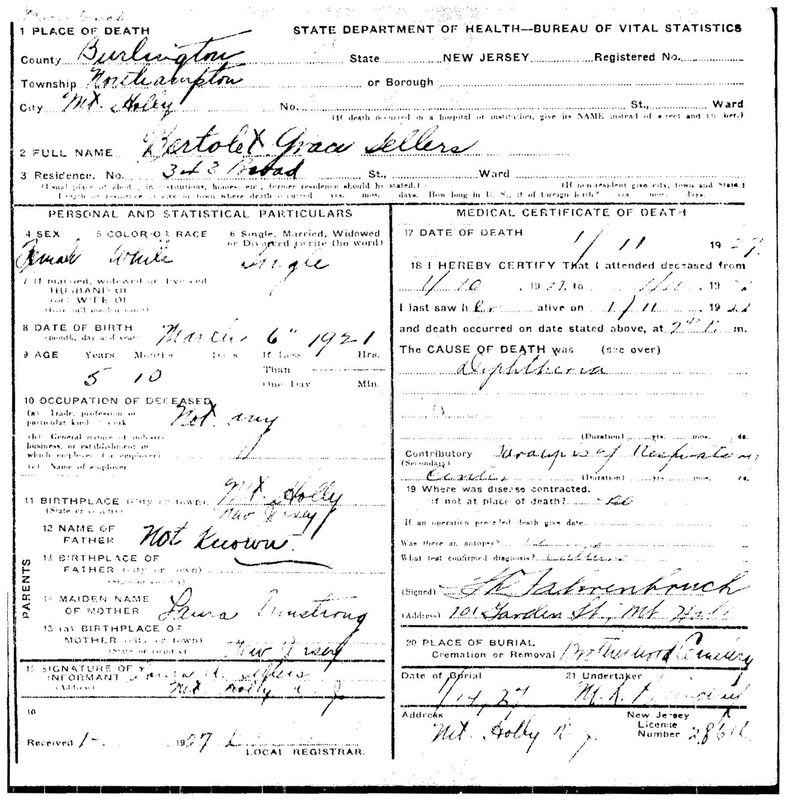 1905: In the 1905 New Jersey state census, Thomas was enumerated in Burlington County. Also in the household were Jane and children Anna, Carrie, Mary, and Edna. 1910: In the 1910 U.S. population census, Thomas was working as an insurance agent and living in Mt. Holly, Northampton Township, Burlington County, New Jersey. Family members living with him were Jane and children Anna, Carrie, Mary, Edna, James, and Thomas. They were enumerated on April 27. 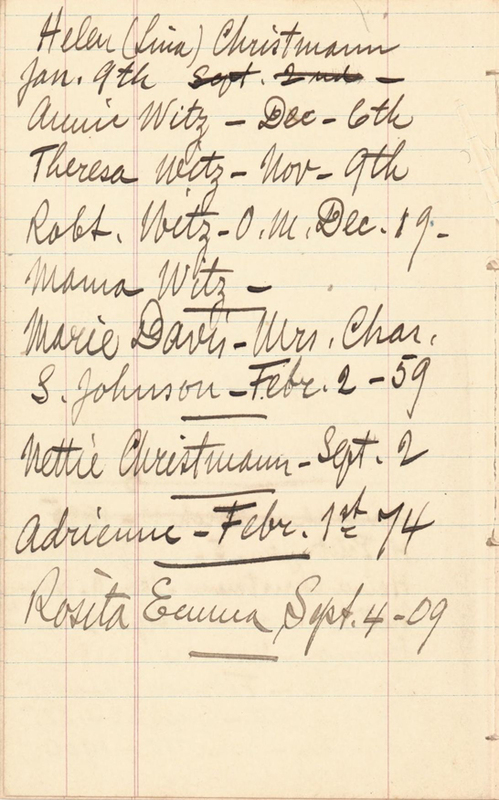 1915: In the 1915 New Jersey state census, Thomas and family were still living in Mt. Holly, Northampton Township, Burlington County. The other family members enumerated were Jane and children Mary, Edna, James, Thomas, and John. 1920: In the 1920 U.S. population census, Thomas had moved to the city of Burlington in Burlington County and was working as a farm laborer again. 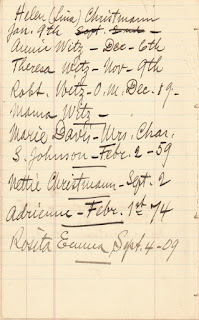 The enumeration was in February, but no date is on the page. Also in the household were Jane and children Edna, James, and Thomas. 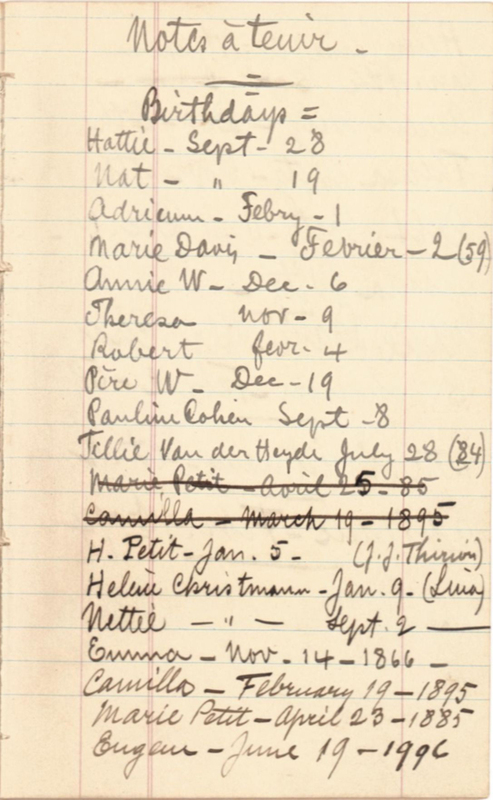 1930: In the 1930 U.S. population census Thomas and Jane no longer had any children living at home with them, and Thomas has no occupation listed. They were back in Mt. Holly, Northampton Township, Burlington County and were enumerated on April 23. 1940: In the 1940 U.S. population census, Thomas and Jane were again in Mt. Holly, although the census notes that in 1935 they were living in Burlington. 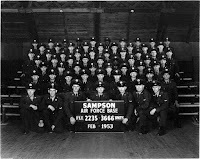 They were enumerated on April 15 and have no occupations listed. When the 1950 census is released I hope to find Thomas in that, as he did not die until 1951. That should give me a total of twelve censuses for him. A new talk has just been scheduled in Oakland! Often genealogical research regarding African American ancestors ends with the 1870 U.S. census, as earlier records of enslaved peoples rarely contain surnames. Despite this significant barrier to detailing black life in the Colonial and Antebellum eras, there are online resources that can enable one to develop a fuller picture of one's ancestors. In this presentation Dr. Foy will discuss and demonstrate such online resources. Speaker bio: Charles R. Foy is a social historian and an Associate Professor of History at Eastern Illinois University. He specializes in uncovering the hidden lives of black mariners in the Age of Sail. 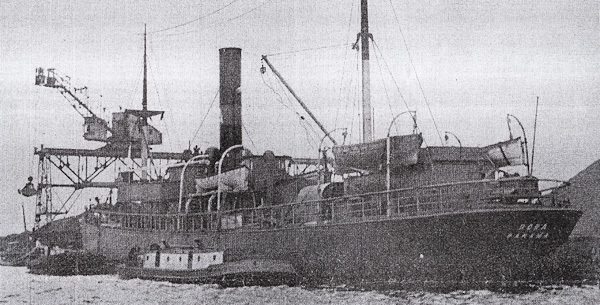 He continues to work on the development of a black mariner database that as of 2013 contains records on more than 24,000 black mariners and black maritime fugitives. Dr. Foy is in the Bay Area for a couple of weeks and generously offered to give this talk while he is here. The talk is free, and everyone interested is welcome to attend.